Recent studies show that American Indian communities have some of the highest rates of domestic travel, and are more likely to be connected on social media with each other. While the data doesn’t indicate precisely where American Indians are traveling, the fact that many native communities are connected on Facebook seems to suggest that they are meeting up with one another. This trend is particularly apparent in the upper Great Plains and the Four Corners region, where the overall population density is low, but many counties rank proportionately high in native population. The distances that native communities go to remain in touch with each other speaks to traditional social systems as well as the history of colonization. In precolonial times, when nomadism was still common among many native peoples, tribes would travel great distances together to meet for annual trade rendezvouses, or to perform sacred ceremonies together. 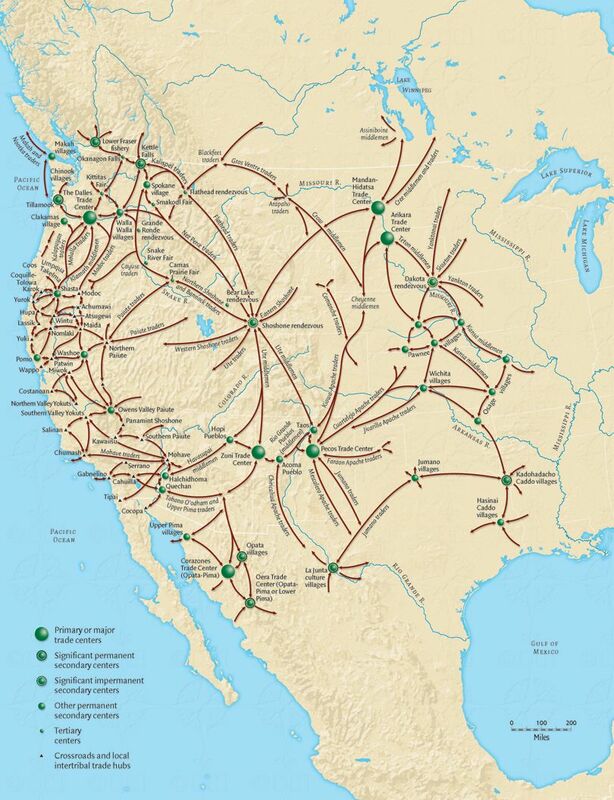 After the mass-displacement of entire tribes because of early Indian removal policies, and later because of residential schools and the 1956 Indian Relocation Act, tribes were dispersed and relatives were often separated by hundreds of miles. Maintaining relationships with those distant relatives meant long trips or communicating through other methods. Today, that primarily means social media platforms like Facebook. The Facebook data used in the map was recently published in the New York Times. For this map, we featured Apache County, Arizona to demonstrate the connectedness of Indian Country because it is 73% American Indian, and is home to the Navajo and Fort Apache Reservations, but the connectedness is still apparent when looking at many other indigenous-majority counties. The Pan-Indian gatherings of the 20th and 21st centuries, like the Society of American Indians, the American Indian Movement, Idle No More, and Dakota Access Pipeline protests, further bonded distant communities. After the American Indian Religious Freedom Act of 1978, when natives could finally openly practice their sacred ceremonies, many also began to travel to attend Sun Dances, potlaches, and peyote ceremonies, epitomized by the annual Sun Dance at Crow Dog’s Paradise on the Rosebud Reservation – an annual assembly of indigenous people hailing from ‘Canada’ all the way to ‘South America.’ And lets not forget the many inter-tribal celebrations, socials, and powwows. In modern times, all this driving has an unfortunate effect: Indian Country is disproportionately afflicted by automobile accidents. 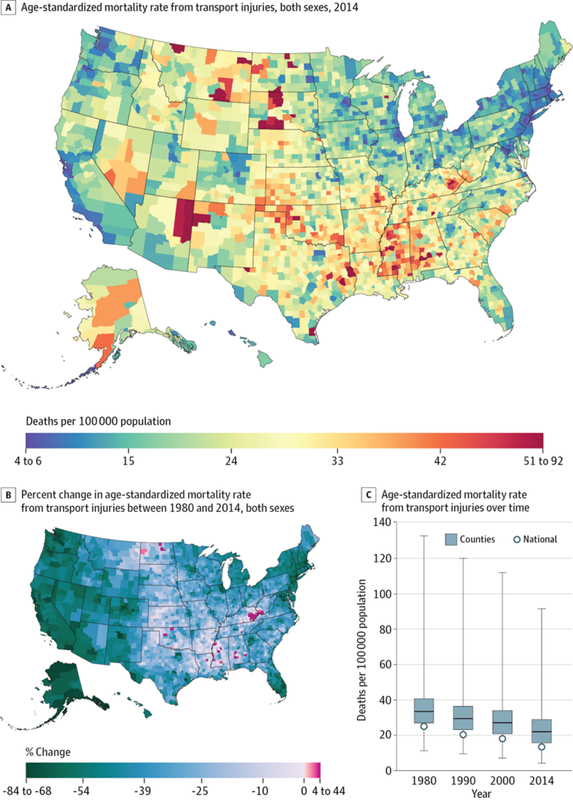 As this map shows, the US counties with the highest rates of transport-related mortality are those which are home to Indian reservations in the Southwest and Great Plains. Indigenous unity is a testament to the power to overcome oppression, but even more, it’s a sign that some bonds cannot be broken. This map can be reused under the Decolonial Media License 0.1. Previous Where Does the Water Go?